Akshay Kumar and . Deepika Padukone will be seen together in a new Bollywood movie named Made in China (2009) . The film is being directed by Nikhil Advani and is an action packed film to be shot in China starting in early 2008. During the shooting the film stars will stay in Shanghai and Beijing. Indian Idol 3 to the final 3. On today's show, Adnan Sami, was the guest judge and he had given his songs choice to the 3 contestants to sing. Emon started off with Yeh jo mohhabat hai from Kati Patang, followed by Ek ladki beegi bhaagi si and then Amit Paul followed up with Kora Kaagaz Tha Yeh Mann Mera. All three sang really well and received high marks from all the judges. Then in round 2, Enom sang Banke tera jogi, Prashant with Bheege honth tere and Amit Betaab dil. Sachin Tendulkar , Saurav Ganguly , and Robin Uthappa lead India to a thriling victory over England in the 6th ODI played at the Oval. England batted first and set a big total of 317 runs for India to chase. India came out hitting with Sachin and Saurav partnering for 150 runs for the opening stand. They both was dismissed within a short time there after the run rate climbed. 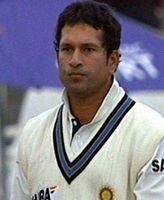 Sachin again was left short by 6 runs to get yet another century. The middle order played well but quick outs left the total out of sight. Dhoni and Uthappa played well and until Dhoni was dismissed with 2 overs left and Uthappa made some great stoke to get India the win with 2 balls to spare.